On this tour we travel deep into the Sahara Desert to a comfortable house in Aousserd to look for the recently-discovered Golden Nightjar. Other target birds here include Black-crowned Sparrow-lark, Dunn’s Lark, Cricket Longtail, Fulvous Chatterer and Desert and Sudan Golden Sparrows, whilst at an oasis we should find both Crowned and Spotted Sandgrouse. At the coast we will look for Great (White-breasted) Cormorant, Lesser Crested and Royal Terns and possibly Kelp Gull, all within the Western Palearctic. Day 1 Mid-morning flight from London Gatwick via Casablanca to Dakhla, where we arrive in the late evening and spend the night in a comfortable hotel. Day 2 Taking packed breakfasts with us, we will begin the long journey inland towards Aousserd on a decent road, stopping at either a private site or Gleb Jdiane to watch sandgrouse coming in to drink. In the mornings, Crowned Sandgrouse is the most likely species, but smaller numbers of Spotted Sandgrouse can occur. Other birds in the area include Thekla’s Lark, Great Grey Shrike and Red-rumped Wheatear; in 2016 an Allen’s Gallinule was found here, and anything can turn up on migration. Closer to Aousserd we will start our search for Cricket Longtail. This enigmatic species is right on the edge of its Western Palearctic range here, although it is quite common in the right habitat. Cream-coloured Courser, Brown-necked Raven, African Desert Warbler and Desert and White-crowned Wheatears are also present. Black-crowned Sparrow-lark can often be found, while another speciality that can occur is (African) Dunn’s Lark; both species are irruptive, however, and are easier to see in some years than in others. Larks can include Greater Hoopoe-lark and Bar-tailed, Desert and Thick-billed Larks whilst the Crested-type Larks in the area may actually be Maghreb Larks. Desert Sparrows are much commoner here than in their former stronghold of Merzouga as are Fulvous Chatterers. Sudan Golden Sparrow can be found in the Desert Sparrow flocks and seven were seen on our 2019 tour, although they are irruptive depending on whether it has been a wet winter. We will spend the next four nights at a comfortable house in Aousserd with two beds (sheets and blankets supplied) in each of the three rooms. There are two bathrooms with hot-water showers shared between the rooms and the house has a kitchen where our cook will prepare meals for us to eat in a separate dining room/lounge. Days 3–5 We will have a further three whole days (and nights!) to search for the speciality birds of the area and, with this amount of time, who knows what we may discover in this little-birded region, as Blue-naped Mousebird has been recorded slightly farther south in Mauritania, so you never know your luck! We are scheduling three evenings in the desert to look for Golden Nightjar (recently discovered breeding in the Western Palearctic) as sandstorms can sometimes envelop the area and, of course, birds are difficult/impossible to find in these conditions. 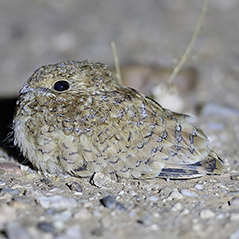 We may have to travel a long way off road in our 4 x 4 vehicles to remote Oueds as the Golden Nightjars move sites from year to year; in 2019 we found our birds over 60 km from the road! A large variety of migrants pass through the desert and in the acacias in the Oueds we may see Western Orphean Warbler, Western Bonelli’s Warbler and European Bee-eaters whilst Barn Swallows pass through on a broad front together with raptors such as Booted Eagle and Eurasian Marsh-harrier. During the day we will also visit a variety of sites where Lanner Falcon and Pharaoh Eagle-owl breed. A variety of animals may be seen during our night drives and these may include Fennec and Rüppell’s Foxes, Golden Wolf, Sand Cat, Lesser Egyptian Jerboa, Desert Hedgehog, Cape Hare, Horned Viper, Fat-tailed Gerbil and Spiny-tailed Lizard. Day 6 We will leave Aousserd early this morning to begin the 267-kilometre drive back towards Dakhla. Seawatches on the seaward side of the Dakhla peninsula may produce Cory’s Shearwater, Northern Gannet and Great Skua; on our 2016 tour both Band-rumped and European Storm-petrels were seen, and in March 2017 a White-throated Bee-eater was seen outside a local hotel. Great (White-breasted) Cormorants can be found in small numbers here but the taxonomy is still uncertain as to whether they are Moroccan or White-breasted. We will then visit the bay to check the state of the (unpredictable) tide to see how far out we will need to walk to scan the gulls and terns. Our targets here are Lesser Crested and Royal Terns in amongst the huge numbers of mainly Lesser Black-backed and Yellow-legged Gulls with smaller numbers of Audouin’s and Slender-billed Gulls. Other terns may include Sandwich and Little. We should check the gulls carefully as Kelp Gull is also possible here, and by carefully checking any small gulls we may even find something outrageous like Grey-hooded Gull. Overnight in a comfortable hotel in Dakhla. Day 7 We will take an early breakfast and drive the short distance back to Dakhla Airport for our journey back to London Gatwick, again via Casablanca, arriving mid-afternoon. General Information The climate can vary from warm in the desert to cool on the coast. Rain is unlikely (it rains, on average, three days a year!) but strong winds are a feature of this area and we may encounter sandstorms. There will be a moderate amount of walking, mainly on flat (but sandy) ground. Insects are not a problem. Visas are not required for EU citizens. Accommodation standards are good, with en-suite facilities for two nights at the coast and two bathrooms with hot-water showers shared among three rooms in our house in Aousserd, which even has electricity! Please note that we may not be able to accommodate singles at the house in Aousserd. No camping is involved! Group size Minimum number for tour to go ahead: 4; maximum group size: 6 with 1 leader. Price includes economy flights between London and Dakhla, all transport within Western Sahara, accommodation in twin-bedded rooms, all food and guiding services throughout. Excluded are insurance, drinks, gratuities and items of a purely personal nature..